Remember whenever you link up to just one blog your amazing creativity can be seen on all seven of our blogs! 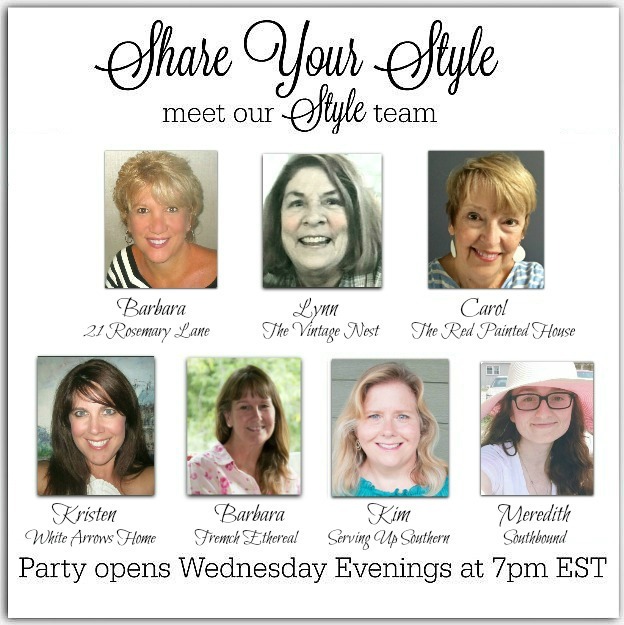 I so enjoyed perusing all of last’s weeks link ups ….. they are all so inspiring. Here are a few that I fell in love with. Interior Frugalista shares her non-traditional pumpkin topiaries with copper elements. Perfect right up through Thanksgiving. Just beautiful! Since tonight is Halloween night, I had to show you Deb’s Buzz‘s haunted tablescape. So much fun! Anita of Cedar Hill Farm House has a wonderful post on French chairs and where to find them. I have several in my own home that I have refinished and never tire of. Such timeless pieces. on making an easy DIY acorn and pine cone garland. So many ways to use this in your Fall and Christmas decorating. As I write this post, the weather outside is cold, with a steady rain…brrrrr. This Bailey’s Pumpkin Hot Chocolate drink seems the perfect antidote to chase the chills away. Thank you Living on Cloud Nine for this yummy recipe. If you were featured please make sure to grab our cute feature button to proudly display on your blog! And now it is on to the party!! Thank YOU for tuning in each week Debbie! !